A compound derived from the marijuana plant that won't get anyone "high" is being heralded as a miracle supplement used to treat dozens of ailments from anxiety to acne, inflammation to insomnia, and schizophrenia, stress, and PTSD. The compound, known as CBD, is showing up in health supplements, ice cream, and infused drinks, but researchers warn that customers may be paying very high prices for very little health benefit. "There are so many people using CBD and nobody knows how to properly dose," said Marcel Bonn-Miller, an adjunct assistant professor at the University of Pennsylvania's Perelman School of Medicine who researches cannabinoids. "From a consumer standpoint, they could be wasting a mountain of money." CBD is the lesser-known cousin of marijuana's psychoactive molecule, THC. Some analysts believe the market for CBD — formally known as cannabidiol — eventually could overtake all other forms of cannabis. The Brightfield Group, which researches the CBD and cannabis industry, estimates the market will explode to be worth $22 billion by 2022. But CBD has only one FDA- and DEA-approved application: as a treatment for some rare forms of pediatric epilepsy. The pharmaceutical Epidiolex is a highly purified form of CBD that should be available with a doctor's prescription by the end of the year. The price tag for the medicine, however, is staggering. According to the manufacturer, GW Pharmaceuticals, a year's supply will cost a patient without insurance $32,500. A pint of Little Baby’s CBD frozen dessert in chocolate contains a total of 100 mg of CBD, serves four, and costs $20. Despite the fact that Epidiolex is the only legal form of CBD, products laced with it are openly available in Philadelphia. It's found in frozen desserts at Little Baby's Ice Cream, in fruit smoothies at Fuel, in coffee drinks at cafes, and in cartridges sold in vape shops. It's even packaged as a pain reliever for dogs and available at some veterinarians and pharmacies. A tastefully appointed boutique that opened this month in Northern Liberties called Anthology sells only CBD preparations. Most of Anthology's goods are sourced from Oregon. But the store also sells Bouquet brand capsules produced by Max Tuttleman, a Philadelphia philanthropist and cannabis entrepreneur. A bottle of Bouquet CBD, containing 30 capsules with 50 mg of CBD in each dose, will set you back $79.99, a relatively modest price compared with most other CBD products — which can soar to hundreds of dollars. When buying CBD products, it's caveat emptor. Because non-prescription CBD is not legal, there is no FDA oversight. Few products are regularly tested. Many are inaccurately labeled. No manufacturer is allowed to make any medical claim for its products. Tod Cooperman, president of ConsumerLab.com, bought the most popular CBD products on the internet and tested them for potency and then ranked them by price. Cooperman found that the results varied widely. The dose of CBD per "manufacturers suggested serving" ranged 10-fold from 2.2 mg to 22.3 mg. And the cost to obtain 10 mg of CBD from each product ranged more than five-fold — from 80 cents to $4.50. That doesn't sound expensive at first. Until you learn that huge doses — between 200 mg and up to 1,000 mg of CBD — were used in small trial studies to treat anxiety, seizures, insomnia, pain, and PTSD. Do the math. At 80 cents per 10 mg serving, a single 300 mg dose would cost a patient $24. At $4.50 per 10 mg, a 300 mg dose would run $135. "It's a crazy expensive drug," said Penn's Bonn-Miller, who has conducted tests on 84 CBD products, with similar findings. "Most people cannot afford that on a daily basis." In addition, a CBD study that Bonn-Miller co-authored and published in JAMA last year found that nearly all the tested preparations were mislabeled and that 26 percent contained far less CBD than advertised. Bonn-Miller was not at liberty to identify those products. Elixinol Natural Drops Hemp Oil + Coconut Extract contained 1.3 percent CBD. That translated to a cost of 80 cents per 10 ml. $29.99 per fluid ounce. 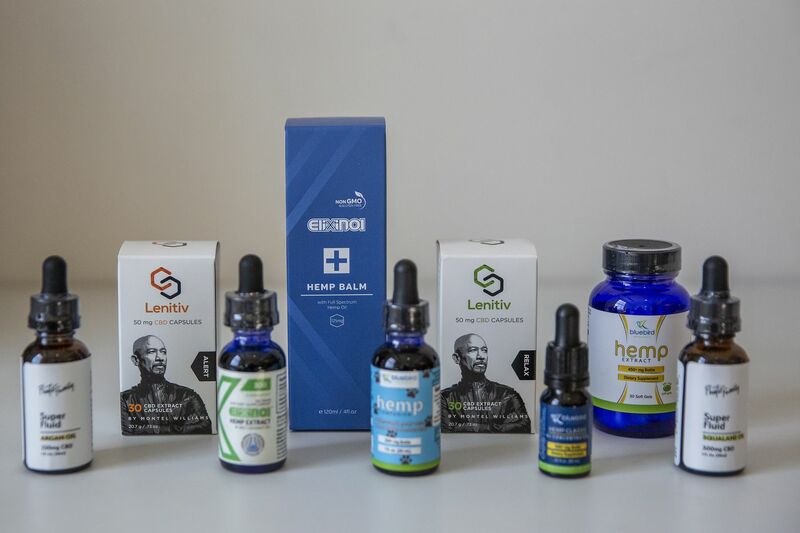 According to Consumer Labs, the lowest overall cost for CBD was found in Elixinol Natural Drops Hemp Oil + Coconut Extract at 80 cents per 10 mg.
Bluebird Botanicals Hemp Classic 6x Concentrated cost 82 cents per 10 mg. Each bottle of oil is labeled saying it contains approximately "60 servings." CW (Charlotte's Web), championed by CNN's Sanjay Gupta, produces a mint chocolate-flavored oil with a cost $1.54 per 10 mg. Most people who take CBD as a dietary supplement consume between 10 mg to 20 mg per day, often in capsule form. Some report positive results at the small dose. "People believe they're getting a benefit," Cooperman said. "A family member asked if she could try one for leg pains she was getting at night, and she said she felt an effect even at a dose of 10. With a 20 mg dose she even had a dry mouth. Granted this is an 'n-of-one' [a very small small sample size]. But I believe there's some efficacy at a low dose." Bonn-Miller stressed there haven't been any organized studies to show whether low doses are effective. "From a scientific perspective, there's no data to support it," Bonn-Miller said. "I would say the placebo response for CBD is quite high, even with epilepsy. There's so much buzz and expectation that maybe somebody taking 10 or 20 mg a day might feel better or sleep better. "Is that because of the drug, or because they want to feel better so badly that it works?" Bonn Miller said. CBD products. Bluebird Botanicals Hemp Classic 6 x Concentrated. ConsumerLab found 22.3 mg of CBD per 15 drops. About 4.8 percent of the oil is CBD, the highest concentration in the products they tested. Cost: 82 cents per 10 mg. $109.80 per 1 fluid ounce. Elixinol Natural Drops Hemp Oil + CoconutExtract contained 1.3 percent CBD. That translated to a cost of 80 cents per 10 ml. $29.99 per fluid ounce. Look for product that lists the amount of CBD per serving. If it only lists "cannabinoids," it may not contain CBD. If "hemp extract" is listed as an ingredient, it likely contains CBD. CBD is made primarily from the flower buds of low-THC cannabis. If "hemp oil" is listed as the only ingredient, the product is made from seeds. Hemp seeds don't contain either CBD or THC in any significant amount, Cooperman said. CBD is fat soluble. So take it with a large meal rich with fat and oils. "It's not absorbed well if you take it on an empty stomach," Cooperman said. Other researchers advise against taking CBD that is Chinese-sourced; the standards for purity don't match those of American manufacturers, which typically grow their cannabis in Colorado, Kentucky, and Oregon. Some Chinese CBD has been found to be tainted with heavy metals and concentrations of pesticides. Major insurance companies will cover most of the cost for children with two rare forms of epilepsy, Dravets and Lennox-Gastaut syndromes. Getting approval for an off-label use may take persistence. "If a physician requests Epidiolex for off-label use to treat something other than these specific syndromes, their request would go through individual review by clinicians in accordance with our internal Experimental/Investigational Use Pharmacy Policy Bulletin," said Virginia Calega, M.D., vice president of Medical Management and Policy at Independence Blue Cross. In other words, good luck getting approval for a prescription to treat your nagging headaches. If CBD isn’t legal what risks are you taking with that tincture? According to an October statement by the DEA, with the exception of Epidiolex all other CBD products are Schedule 1 substances, which means the federal government considers them to be just as illegal as LSD and heroin. So don't believe company sales pitches that maintain their CBD products are legal because they're "dietary supplements" extracted from "industrial hemp." But outside of a few raids on shops in the South and Midwest, the federal government seems to turning a blind eye. The FDA hasn't busted any individual CBD users and at most has sent warning letters to producers that have made unsubstantiated medical claims. CBD tinctures for sale at Anthology in Northern Liberties.